Total shoulder replacement, also known as total shoulder arthroplasty (TSA), is a tremendously successful procedure for treating the severe pain and stiffness that often result at the end stage of various forms of arthritis or degenerative joint disease of the shoulder joint. The primary goal of shoulder replacement surgery is pain relief, with a secondary benefit of restoring motion, strength, and function. 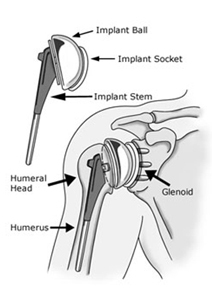 The surgery involves replacing the humeral head (or joint "ball") and the glenoid (called the "socket"). [see Fig. 1] Partial shoulder replacement (or hemi-replacement) may also be indicated with certain severe shoulder fractures of the humeral head. This technique requires the replacement of that component only. Shoulder replacement was first performed in the U.S. in 1953. Since that time, the procedure has been refined with the use of new implant materials and design, as well as improved surgical, anesthetic, and rehabilitation techniques. The most common indication for TSA is shoulder pain due to arthritis that cannot be controlled with non-operative treatment such as anti-inflammatory medications and rest. Accompanying the pain is a progressive stiffness and loss of motion, with the patient often experiencing a grinding or grating sensation within the shoulder joint that is disturbing and painful. A series of standard x-rays are taken to determine the condition of the shoulder joint. A CT scan and Magnetic Resonance Imaging (MRI) may also be necessary to evaluate bone quality as well as the condition of important surrounding structures such as the rotator cuff tendon. Those with possible nerve damage may also undergo an EMG test. In some chronic arthritic conditions such as ankylosing spondylitis, which may be associated with a stiff elbow and a stiff shoulder, TSA may be considered to improve overall function in the shoulder and arm, regardless of the pain level experienced by the patient. Steroid injections are sometimes recommended prior to a TSA procedure. Most candidates, however, will not experience lasting relief from these injections, making TSA a necessary next step if pain is uncontrolled. Likewise, some patients experiencing early osteoarthritis may consider more conservative management (such as physical therapy, medication, cortisone injections, or even shoulder arthroscopy) before TSA is deemed a necessary measure. Recommendations for surgery are based on the patient's pain and disability, rather than age. After undergoing an orthopedic evaluation, you and your surgeon will decide if total shoulder replacement surgery is the best possible treatment for you. If so, your team of medical experts will provide you with information on how to prepare for the procedure. A few weeks before your procedure, you will need to have a complete physical by your primary care doctor to rule out any other medical problems that may interfere with your surgery. At this time, your doctor also will take your medical history and order various tests that must be performed before surgery, such as blood tests, urinalysis, a chest X-ray and an electrocardiogram (EKG or ECG). Be sure to tell your orthopedic surgeon about all medications that you are taking. They will then advise you on which medications you should continue or stop taking prior to surgery. In addition, if you develop any kind of infection prior to surgery, such as a cold or the flu, notify your surgeon immediately. You should be in the best possible health before your surgery. If you are overweight, your doctor may suggest that you lose weight. If you smoke, it is highly recommended that you stop prior to your surgery because smoking can change blood flow patterns and delay healing and recovery. Seven days prior to surgery, you should stop taking all aspirin or other non-steroidal anti-inflammatory drugs (NSAIDs) like Aleve, Motrin, Ibuprofen, Advil and Naproxen. You may continue taking Cox-II inhibitors such as Vioxx, Celebrex and Bextra. You may take Tylenol for pain and discomfort. Shoulder replacement surgery can result in blood loss that may require blood transfusion. Therefore, it is suggested that you donate your own blood, usually one unit, before surgery. If you are unable to donate blood for yourself, your family or friends may donate for you. They must have the same blood type and meet criteria for donation. Otherwise, banked blood is available. Banked blood, which is from volunteers, is screened for viral diseases and is matched to your blood type. If you are having surgery due to an infected prosthesis, you are not allowed to donate your own blood for surgery. In these cases, you must have family or friends donate blood or receive blood from a volunteer. Significant dental conditions and problems should be treated prior to surgery. Although uncommon, an infection can occur as a result of these dental procedures if bacteria enter your bloodstream. If necessary, be sure to schedule an appointment with your dentist before your joint replacement surgery to treat any problems you may have. It is recommended that you plan for your return home prior to your admission to the hospital so that you are as comfortable as possible. We recommend that a family member or friend be with you 24 hours a day for the first week following your surgery. In addition, make sure that you have rides planned from the hospital and to your first follow-up visit, which will be one week after surgery. Also, you will not be able to shower for the first week until the incision heals. Your friend or family member can help you with sponge baths and other hygienic care. Because your arm will be in a sling for the first four to six weeks following surgery, you should place everything in your house that you use on a regular basis at elbow level. This way you will not have to raise your arm. Also, you will not be able to drive for four to six weeks while you are recovering. Pack a small suitcase for your hospital stay that includes a list of all medications you are taking, personal hygiene items, comfortable and loose clothing, a knee-length robe and slip-on shoes. Please leave all of your valuables, including jewelry, wallet and watches, at home. It is not necessary to bring your actual medications, however do bring a list of your medications and their dosages, as the hospital will provide you with your medications. Also, we recommend you to bring a phone card. Our hospital staff will call to notify you of your surgery and scheduled admission times. You may not eat or drink anything after midnight the night before your surgery. Please take a shower or bath and wash your body thoroughly. Try to rest and go to bed early. Total shoulder replacement surgery replaces your shoulder's damaged bone and cartilage with a metal and plastic implant. The shoulder is a ball-and-socket joint, much like the hip joint. The ball is the top of the arm bone, or humerus, and the socket is within the shoulder blade, or scapula. During shoulder replacement surgery, the ball is removed from the top of the humerus and replaced with a metal implant. This is shaped like a half-moon and attached to a stem inserted to the center of the arm bone. The socket portion of the joint is then replaced with a plastic socket that is cemented into the scapula. The procedure takes approximately two hours, however the preparation before the operation and the recovery after may take several hours. Patients often spend two hours in the recovery room and two to three days in the hospital after surgery. You will be admitted to the hospital on the day of your scheduled surgery. You will be asked to arrive two hours before the start of your surgery. Once you are admitted, you will be evaluated by an anesthesiologist. The most common type of anesthesia is regional anesthesia where your arm will be numbed by placing anesthetic medicine to your neck before the start of the operation. Supplementary anesthesia will then be given through an intravenous (IV) drip that keeps you asleep for the entire surgery. You will discuss this with your anesthesiologist prior to your surgery. Total shoulder replacement can be a very successful operation, like hip and knee replacement surgeries. However, it is a difficult operation and the surgeon should be well-trained to perform it. At We Care India partner hospitals, we are investigating the possibility of image-guided surgeries to better identify the anatomy and bone structures of each shoulder so that we can improve the outcome of shoulder replacement surgery. We are investigating the possibility of doing the surgery with smaller and less traumatic approaches so that the rehabilitation can be quicker and less painful. After surgery, you will be moved into the recovery room where you will stay for approximately two hours. During this time, you will be monitored until you awaken from anesthesia, at which time you will be taken to your hospital room. Your operated arm will be numb from the regional anesthesia, which also can provide good pain relief for the next day. Another side effect of the anesthesia is that you will not be able to move the fingers or wrist on the operated arm. Typically, you will stay in the hospital for two to three days, but this depends on each individual and how quickly he or she progresses. After surgery, you may feel some pain that will be managed with medication to make you feel as comfortable as possible. This will be given either by injection or pump and should be used as needed. To avoid lung congestion after surgery, you should breathe deeply and cough frequently to clear your lungs. A Cryocyff, an icing device that will help control pain and swelling, will be placed on your shoulder in the recovery room. You will be able to bring this device home with you and should use it frequently to minimize any discomfort you experience. In some instances, the insurance company may not approve the use of a Cryocyff, in which case we will use ice packs instead. Your arm will be in a sling for four to six weeks after surgery. If you have regional anesthesia, it will take 12 to 18 hours to wear off, during which time your hand and arm will be numb. When you are able to move your hand, begin making a fist and holding it for five seconds. This small exercise helps to keep your blood circulating and should be done frequently. Total shoulder replacement is a very successful operation and the 10 year survival rate is up to 90 percent. Many patients end up with extremely functional shoulders and are able to return to the activities of daily living and low impact sports without pain. The operation may have some complications, although they are very rare. Complications may include infection, bleeding, shoulder instability, tearing of the rotator cuff, fracture and loosening of the prosthesis. Arm and shoulder movements are very important for recovery. Usually the first day after surgery, your orthopedic surgeon or another doctor will begin to work with you and teach you specific exercises to regain full arm and shoulder movement. The doctor will provide you with a list of exercises that you can do to keep your muscles strong without damaging the replaced shoulder. These exercises are necessary to prevent your elbow and shoulder from getting stiff. They will be difficult to perform in the beginning, but will get easier every day. You also will be visited by a physical therapist who will reinforce these exercises while you are in the hospital. During your hospital stay, you will attend physical therapy one to two times a day. An occupational therapist and nurse discharge planner also will help you prepare for your homecoming. You will be discharged from the hospital on the second or third day following your surgery depending on your recovery. Once you have returned home, it is very important to follow your orthopedic surgeon's instructions during the first few weeks after surgery. You will be given prescriptions for pain medication, anti-inflammatory medicine and aspirin, which helps to prevent blood clots. Use the pain medication only if you are experiencing pain. Take the anti-inflammatory as prescribed. You will have stitches running along your wound on the front of your shoulder. These will be removed one week after your surgery, at your first follow-up appointment. Call your surgeon immediately if your incision swells, drains, becomes red or painful, or if you develop a temperature over 101 degrees Fahrenheit. Before leaving the hospital, your incision will be covered with a dry bandage. Please do not get the incision wet or dirty. The dressing can be changed daily and it is not uncommon to have a small amount of blood on the dressing. Do not shower or go in the bath until you return for your follow-up appointment. The incision has not healed yet and getting the incision wet puts the shoulder at risk of infection. After the stitches are removed and if the doctor allows you to, you can take a shower and let the water run over the wound. Do not go into a tub or Jacuzzi to soak the wound. Pat the wound dry after you finish showering. Being physically active is an essential part of recovery. Continue to perform the exercises you learned in the hospital. Before leaving the hospital, you will be given a physical therapy exercise plan to follow. Within the next three to six weeks, you need to protect the shoulder so that the muscles can heal. You should have an appointment to see a therapist within the first or second week after you are discharged from the hospital. During the first few weeks of recovery, the physical therapist may teach or help you perform specific exercises to strengthen your arm and shoulder. You may experience swelling and bruising of the hand and arm. This is normal and results from the swelling and bruising from your shoulder, which travels down the arm. Unfortunately, there is no treatment for this, but it is recommended that you bend and straighten your elbow frequently and make a fist to help keep your circulation flowing. Your arm will still be in a sling and it is recommended that you wear it when you are in public or moving around. If you are reading, watching television or working at a desk, you may loosen it. When you are getting dressed, it is easiest to put your operated arm through the shirt-sleeve first, then put your sling on. You may use your arm to perform normal daily activities, such as eating, writing or shaving, but you may not lift any items or reach out suddenly until you are instructed that it is OK to do so. Six weeks after surgery, when you regain full shoulder movement, you can probably resume driving. At this time, your surgeon also may allow you to return to work, depending on how much physical activity is involved in your occupation. You will also start to strengthen your shoulder up with physical therapy. Please schedule your first post-operative appointment prior to surgery. When you come for your first appointment, you will have an X-ray, so please make sure to come 30 minutes before your appointment time. During the first year following your surgery, routine follow-up visits will be scheduled with your orthopedic surgeon at one week, two weeks, six weeks, three months, six months and 12 months after your surgery. You will be asked to return for annual visits thereafter to assess the status and function of your implant. After your shoulder replacement operation, it is important to perform certain exercises to help strengthen your shoulder and arm and encourage recovery. The following exercises may be recommended by your doctor and should be performed as instructed. Before starting this exercise, remove your sling. With your arm bent at a 90-degree angle, bend and straighten your arm as though brushing something off the front of you. This exercise should be repeated 30 times, three times a day. This exercise will help avoid stiffness in your elbow after being in a sling for long periods of time. Begin this exercise by making a tight fist or by gripping a rubber ball. Hold this position for 10 seconds and then release. Repeat this exercise 30 times, three times a day. This exercise works your hand and helps prevent blood clots. Begin this exercise by standing straight. Pinch your shoulder blades together and hold them for 10 seconds. Then relax and repeat the exercise again. Repeat this motion 30 times, three times a day. This exercise strengthens the muscles around your shoulder blade and allows your shoulder to move more effectively. Start this exercise by bending over at your waist. Support yourself by placing your hand, on the side that did not undergo surgery, on a table or chair. Using your other arm, make small clockwise and counterclockwise circles. Repeat this exercise 30 times, three times a day. Begin this exercise by bending the arm, on the side of the recovering shoulder, at a 90-degree angle. Keeping your elbow against your body, use your other hand to gently rotate your forearm outward until your arm is pointing in front of you. Repeat this exercise 30 times, 3 times a day.